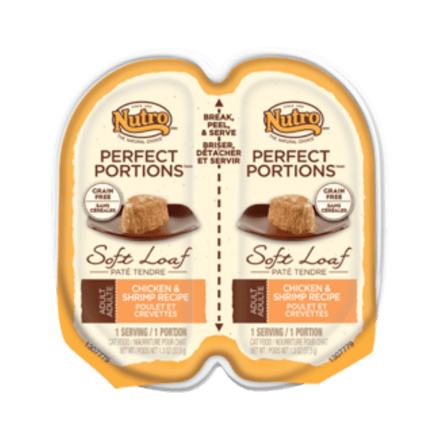 NUTRO™ PERFECT PORTIONS™ Adult Soft Loaf Chicken and Shrimp recipe cat food means no more leftovers in your refrigerator. 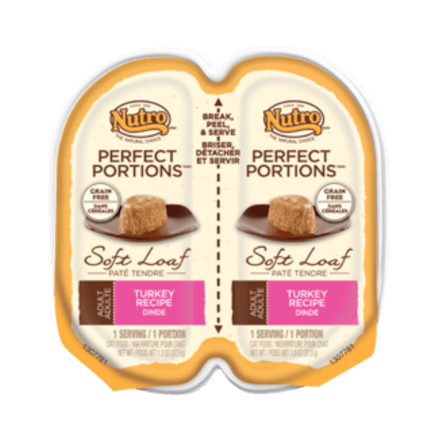 The packaging splits in half, meaning you can serve your cat half now, and save the rest for later, with no messy leftovers. Real chicken is the first ingredient and all PERFECT PORTIONS™ formulas are grain free with no wheat, corn or any artificial flavours or preservatives. That way, your cat gets a fresh meal every time. Guaranteed. Chicken, Chicken Liver, Chicken Broth, Shrimp, Pork Broth, Natural Flavours, Guar Gum, Minerals (Potassium Chloride, Magnesium Sulfate, Zinc Sulfate, Iron Sulfate, Manganese Sulfate, Potassium Iodide, Copper Sulfate), Sodium Phosphate, Fish Oil (preserved with mixed Tocopherols), Vitamins (Choline Chloride, Thiamine Mononitrate [Vitamin B1], Vitamin E Supplement, Pyridoxine Hydrochloride [Vitamin B6], Vitamin D3 Supplement, Folic Acid, Menadione Sodium Bisulfite Complex [source of Vitamin K activity]), Salt, Taurine. These are the recommended feeding amounts based on the ideal body condition for adult cats of various weights. Individual cat's energy requirements may differ. Adjust the amount fed to obtain or maintain your cat's optimum weight. Keep fresh drinking water available at all times, provide plenty of exercise and see your veterinarian regularly. 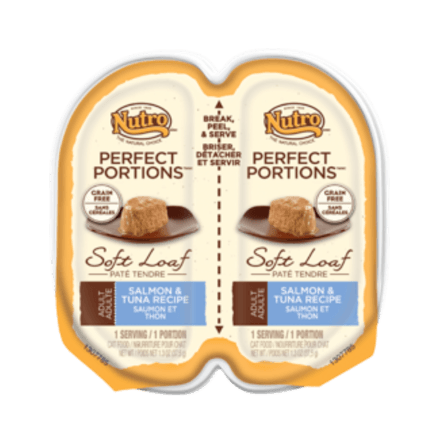 NUTRO™ PERFECT PORTIONS™ Adult Soft Loaf Chicken & Shrimp Recipe Cat Food is formulated to meet the nutritional levels established by the AAFCO Cat Food Nutrient Profiles for maintenance.